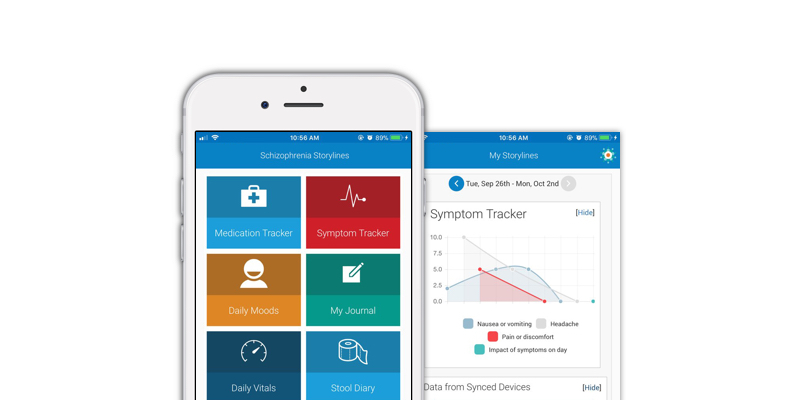 Developed in partnership with the Schizophrenia and Related Disorders Alliance of America (SARDAA), this app makes it easier to record details and specifics about symptoms, medication, moods, and more. Choose what you want to track, and see all the information you need to help you or your loved one who is living with schizophrenia and related disorders. Schizophrenia Health Storylines is developed in partnership with the Schizophrenia and Related Disorders Alliance of America, and is powered by the Health Storylines™ platform from Self Care Catalysts Inc. This app is not meant to replace a clinician or give medical feedback of any kind. It is a tool to help document self-care activities for better care coordination and communication. No one will see your results unless you share it with them. When it comes to coping with a new normal, switching therapies and experiencing new side effects, it’s hard to know where to turn for guidance. More than stats, hearing what worked for a real live person who’s gone through it can help prepare other patients for what they can expect. Your story is also a valuable form of Real World Evidence that can inform decision making in health care, drug development, and patient support programming. Share your story today!